A field of seven fillies and mares will run in Saturday's Grade 1, $400,000 Beldame Stakes for 3-year-olds and up at Belmont Park. The 79th running of the Beldame is the third of four graded stakes races on the day's stacked card, which features the Grade 1, $500,000 Joe Hirsch Turf Classic and also includes the Grade 1, $350,000 Vosburgh and the Grade 3, $200,000 Pilgrim. The Beldame will feature a slate of consistent runners including Claiborne Farm and Adele Dilschneider's Elate, who will make her Belmont Park debut after drawing away by 5 ¼ lengths to win the Grade 1 Alabama at Saratoga last out. Elate's effort in that race bested last Saturday's Grade 1 Cotillion winner It Tiz Well, who finished as the Alabama runner-up. Elate ran her most impressive race to date in the Grade 1 Coaching Club American Oaks, trying in vain to get the upper hand on Abel Tasman. Instead, she lost by a head at the wire, a decision upheld following a steward's inquiry. The daughter by Medaglia d'Oro returned to make a huge statement in the Alabama, and will now make her eighth start of the year for Hall of Fame trainer Bill Mott. A continuation of her persistent presence on the tote board in her fourth Grade 1 start could send her to Del Mar for a start in the Breeders' Cup in November. Elate owns two other victories in her career beginning with her debut where she beat eight others by 12 ½ lengths at Aqueduct. She then returned to finish second in the Suncoast Stakes at Tampa Bay, then finished third behind It Tiz Well in the Grade 3 Honeybee. Sent off as the even-money favorite in the Grade 1 Ashland at Keeneland, Elate was pulled up entering the stretch and subsequently vanned off as a precautionary measure. Elate will make her ninth career start, and break from the rail with jockey Jose Ortiz aboard, her rider for all three of her Grade 1 races thus far. StarLadies Racing and Lisa Troutt's 5-year-old mare Eskenformoney will break from the outside post. Under the guidance of trainer Todd Pletcher, the daughter by Eskendereya seeks her first Grade 1 win and is the race's most experienced entrant, making her 27th start after finishing third in the Grade 1 Personal Ensign on Saratoga's Travers Day undercard. A victory would give Pletcher his sixth Beldame victory would break the tie he shares with D. Wayne Lukas with five. Eskenformoney will be ridden by Javier Castellano in the saddle, the 17th time they have been united. George Hall's mare Money'soncharlotte will carry a four-race winning streak into the Beldame. The 5-year-old by Mizzen Mast is perfect through her 2017 campaign, which began with a victory against four others in an open claiming level race at Parx. She then advanced to the Lady's Secret Stakes at Monmouth, and prevailed before notching her first graded stakes win in the Grade 3 Molly Pitcher. Money'soncharlotte will run from post 5, and will be ridden by Hall of Fame rider John Velazquez. Verve's Tale enters with momentum, winning the $100,000 Summer Colony by a nose at Saratoga for just her third career victory. The daughter by Tale of Ekati broke her maiden in her eighth career start, but was no worse than third in all seven starts prior, and built a versatile demeanor by performing at five different racetracks. Verve's Tale will break from post 2, getting the services of Joel Rosario. Rounding out the field in the Beldame will be Bishop's Pond from post 3, for trainer Jason Servis and jockey Irad Ortiz, Jr., Presumptuous from post 4, for trainer H. James Bond and jockey Rajiv Maragh, and Bombshell from post 6, for trainer Jimmy Jerkens and jockey Luis Saez. 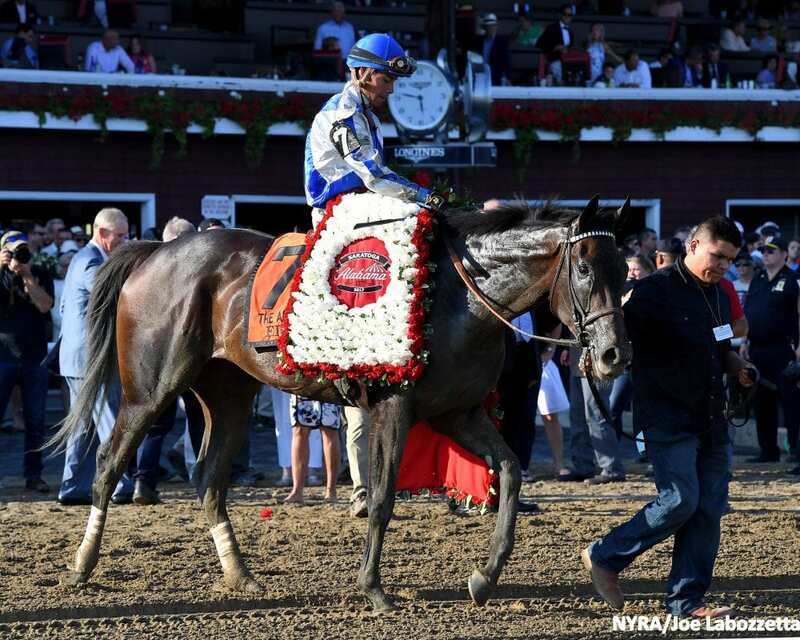 This entry was posted in NL List, Racing and tagged Beldame Stakes, bill mott, Breeders' Cup Distaff, Breeders' Cup Win and You're In, elate, Horse Racing, nyra, thoroughbred by Anthony Affrunti/NYRA. Bookmark the permalink.